A climber's emergency plan with his wife was for her to call 911 if she didn't hear from him by 6am on Friday. With a bivy, she wasn't going to get a call. So we knew there was going to be a Search and Rescue operation...either initiated by our wives or by us. Our plan was to climb Dragontail Peak by the Serpentine Arete car-to-car from the Colchuck Lake Trailhead on Thursday, August 31. We expected to return to the car around nightfall Thursday. We both had cell phones but did not expect to have service (T-Mobile). Each of us carried a one-way emergency-only AQR ResQLink PLB. We started hiking from the Colchuck Lake TH at 4:20am and made it to the base of the route around 7:45am. We climbed three mid-5th class pitches and simul-climbed a 4th class section. On a traverse around the pillar just before the first crux pitch our rope got stuck which cost us maybe 20 minutes. The crux pitches were fun and uneventful and we started the sixth pitch (the one just after the two 5.8 crux pitches) around 1pm. Route finding on the upper section of the climb is difficult. The summit direction is not obvious and there are many 4th to mid 5th class options. Above pitch 6, we trended left on three 5.6-5.8 pitches (with one notable move we had to aid). The climbing was good, but harder than our tight schedule expected which prevented us from simul-climbing a big chunk of the route. In hindsight, we think starting from the 6th pitch, there is a system of loose, sandy gullies that goes right of the ridge crest that we should have followed and simul-climbed. Higher up we managed to regain easy 4th class terrain for a couple hundred feet, briefly lost it, then regained it and managed to simul-climb maybe more 200 feet. We were perhaps 500 ft from the summit when we unfortunately made another route finding mistake that cost us maybe 30 minutes. What looked like a nice sandy path led to a difficult traverse over very loose large rock. The lead climber had to retreat by downclimbing and leaving a cam. These mistakes added up and the sun was setting when we reached a 4th/easy-5th class ledge below the summit block. We were reasonably sure we were on or very near the route, but we weren't absolutely certain that the block towering above us was really the summit. There is another huge rock formation just to the climber's right that looked like it could be higher. We really didn't want to climb to the top of some gendarme on the summit ridge instead of the summit. The beta promised 3rd class ledges near the summit on climber's left but we were still on 4th/easy 5th class terrain. That day we had gained and subsequently lost various "easy 3rd and 4th class" terrain described in beta over the course of the day. We weren't certain whether we still have some more difficult terrain to get the summit ahead of us or not. We didn't want to get into possibly more serious 5th class terrain in the dark so we decided to bivy. The night was predicted to be warm and clear so we thought we had enough gear to wait out the night. It may be a cold and sleepless night but we could safely finish the route in the morning. The first climber's emergency plan with his wife was for her to call 911 if she didn't hear from him by 6am on Friday. The second climber didn't talk to his wife about when exactly to trigger a rescue, but she knew the rough itinerary and expected to hear from him by midnight so we guessed she would trigger a search in the morning as well. We didn’t think we would to be able to contact them by that time because we could only start climbing around 6am. We knew there was going to be a SAR operation. Either initiated by our wives or by us. To avoid a potentially expensive and dangerous search operation (I remember reading somewhere that search is usually much more expensive than rescue) we decided to remove the guesswork as to where we are. We activated both our PLBs to let SAR know where we were so they would not have to search and settled down for the night. At dawn we were preparing to start climbing again. After re-examining our beta and looking at various GPS tracks we had, we determined that the block above us was very likely the summit so we should move climbers left of it. At 6:20am Chelan County Sheriff's helicopter flew to the location indicated by the beacons to take a look at us and motioned for us to stay put. So we did. About an hour later they dropped off volunteers from the Chelan County Mountain Rescue Association on flat terrain near the summit. They walked over the easy 3rd class ledges described in beta to be about 50 feet above us, and one of us led the remaining 50 feet of easy terrain to the rescuers. We facepalmed when we found those promised easy 3rd class ledges were just 50 feet from us! We walked around the summit block on 3rd class terrain, tagged the summit with the rescuers, called our wives from the summit (it turns out even T-Mobile has reception on the summit of Dragontail! ), and walked down with the rescuers to Aasgard Pass to their helicopter pick-up spot. They offered us a helicopter ride out, but we thanked them and hiked out by ourselves. We're both definitely getting an InReach. No rescue would have been necessary if either of us had a way to communicate with the outside world to stop the search. Running out of daylight is a real possibility on these longer routes, particularly with relatively inexperienced parties like ours. We have much to learn about route finding. Emergency bivvies (the space blanket kind) really work. In this particular case, having an emergency bivvy didn't make a life and death difference. However, if the weather was only a little bit worse it could easily be a lifesaver. It's important to discuss your itinerary with your emergency contacts. Give yourself enough buffer and explicitly discuss when to trigger the search operation. For example, one climber in our party expected we would be down at the cars no later than 10pm. He added a little buffer and told his wife to expect to hear from him by midnight. But he didn't discuss when a search should be triggered. With such a large objective such as this route, getting benighted is a real possibility. Therefore a later return time should be agreed to, in this case perhaps 3pm the next day. Great analysis and identification of lessons learned. Dragontail is a big, complex fortress of a mountain and can pose route-finding challenges. Like Dale I also use noon the next day as the threshold for alerting authorities. It took decades of observations before settling on noon. There are many reasons why a trip may go longer than planned. A party is unlikely to overnight near the trailhead. They are likely to be further in, or traveling slowly, and will need several hours to get out and reach cell service. Noon prevents premature activation of SAR by anxious emergency contacts. If there is an accident the trip is usually shorter than originally planned. This is especially true when the party carries an emergency communication device. A PLB activation has only one meaning -send help. I completely agree with acquiring a 2-way satellite communicator such as the In Reach. That said, I disagree with utilizing the PLB in this case. I think PLB use should be limited to *life-threatening* emergencies. S&R organizations typically rely on volunteers and shouldn't be directed toward uninjured parties. Many times the first response for an overdue party is a lone deputy or forest ranger seeing if your vehicle is still at the trailhead, and volunteers on foot are arguably less expensive than helicopter fuel. Finally, I don't understand the logic behind deploying *both* of the PLBs? My disclaimer: I'm armchair quarterbacking, and I wasn't there. Those are my observations based on the post. Again, thanks for sharing and I appreciate any feedback on my ideas. Cheers! 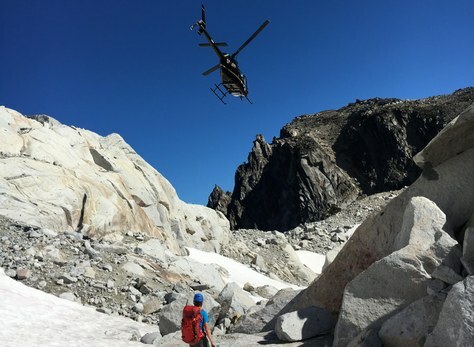 I watched the drama unfold climbing up Asgard pass-the helicopter started circling just after first light, and then going up the south side of Dragontail solo as the climbers/rescuers were coming down the snowfield high above the basin. As a solo climber/hiker the lessons learned here have left me profoundly thinking about purchasing a PLB. Appreciate the write-up, was curious about what actually happened to trigger SAR.